Colorado is best known for its lofty peaks, and rightly so. Fourteeners, peaks reaching at least 14,000 feet elevation, number 53 in this not-flat state. A lesser known side of Colorado is its canyons. On the west slope of the Rocky Mountain Range, sliding toward Utah, are several remarkable canyons. I set out on a sunny August day to explore these hidden chasms carved into red and black rocks. To get to the Colorado canyon country, I coasted downhill from Red Mountain Pass on the Million Dollar Highway. The first rough grey canyon burst out of the rugged mountains near Ouray. The Uncompaghre River tore through ancient Precambrian bedrock and flowed north toward the Gunnison River. 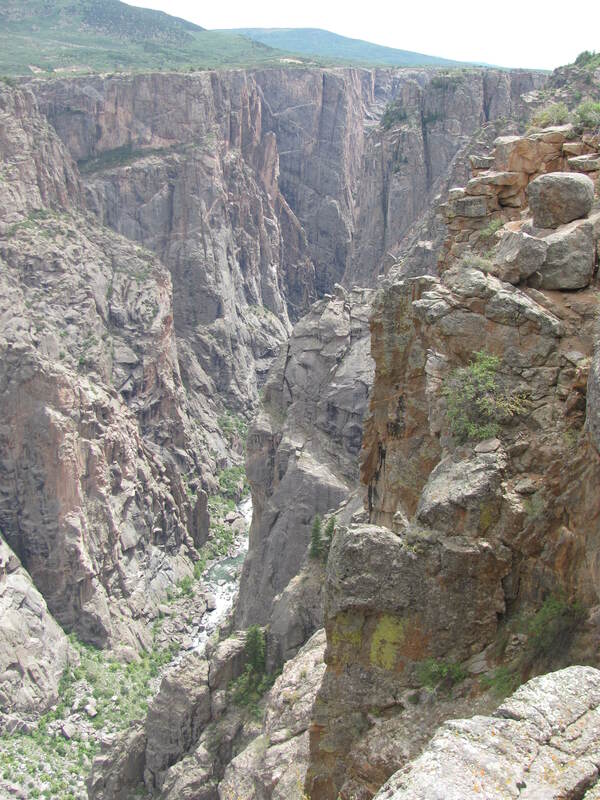 I followed the river’s rushing route through Montrose, then turned east for eleven curving miles up into Black Canyon of the Gunnison National Park. The approach did not prepare me for the Black Canyon. Pulling in to a turnout inside the park, I stepped to the railing, looked down and gasped involuntarily. Sheer cliffs dropped vertically for 2700 feet. I wondered if U2 had been at the Black Canyon when they wrote their lyrics: “Hello hello, I’m at a place called Vertigo.” I literally had to grab onto the handrail to keep from pitching forward. After following a pleasant winding park road out to its end, I rode down the East Portal Road, five miles long at a 16% grade, which led to the bottom of the Black Canyon. Down at the canyon’s floor, the Gunnison River described a paradise of still water running deep below the dam. A tiny campground beckoned, but it was too early in the day to camp. Besides, I had learned at the Visitor Center that poison ivy grew lushly along the river, which spelled trouble in paradise for me. The BMW agreeably powered me back up the grade to the canyon rim and I resumed my journey north. Broad agricultural valleys and small towns dotted the route from Montrose through Olathe and Delta to Grand Junction. There I crossed the Colorado River and rode up into Colorado National Monument, a preserve of red sandstone and shale eroded into graceful formations. The road through the monument was twenty miles of nonstop twisties, with another dazzling view around every corner. Arriving at the campground an hour before sunset, I paused while setting up the tent to watch virga slanting over the Book Cliffs, and canyon rocks flaming red in the sunset. The next morning I backtracked through Grand Junction to reach the Unaweep-Tabegauche Scenic Byway. This sliver of blacktop runs for 90 miles over remote Uncompahgre Divide. Two creeks named simply East and West drain the region. Near West Creek, in the middle of nowhere, I stopped to look at a ruined structure in the shadow of towering canyon walls. “Driggs Mansion” was part of an early 1900s effort to homestead and irrigate the isolated parcel. The long-abandoned stone building waits patiently for the elements to slowly reclaim it. Without warning around a curve in the road, a fancy resort appeared. The Gateway Canyon Resort boasted luxury lodging, fine dining, adventure tours, a spa, a car museum, mountain bike and hiking trails, and special events such as music festivals and artists’ retreats. Briefly I considered venturing onto its manicured grounds, but in my grubby riding clothes and twelve year old motorcycle, I felt out of place. From a distance, it appeared that its location, along the bank of the Dolores River overlooking the Uncompahgre Plateau, was first class. 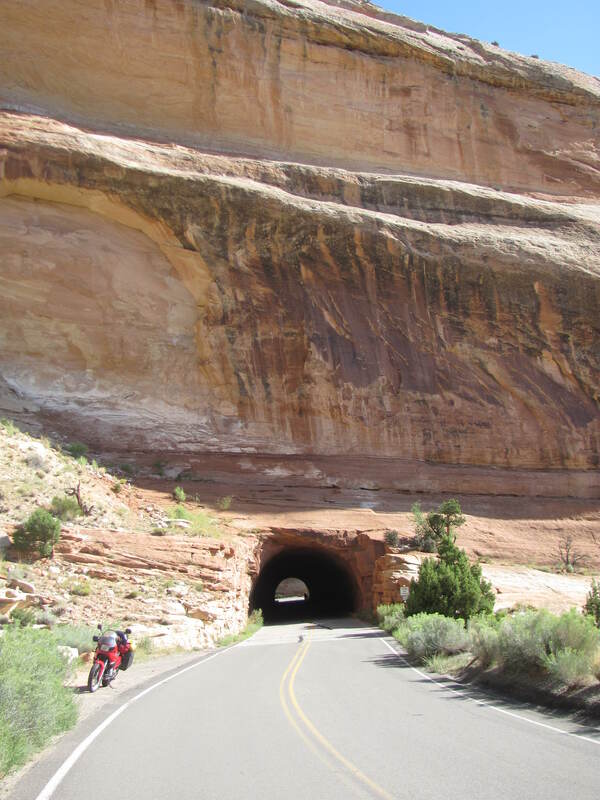 After Gateway, the scenic byway ran southeast alongside the twisting, turning course of the Dolores River through increasingly stunning red rock canyons. The only traffic on the road was other motorcyclists; I waved at a dozen of them while swooping through long delicious curves. I stopped again at a remarkable historical site farther down the Dolores River canyon. Peering over the edge of the canyon, I spotted the wooden framework affixed to the smooth red canyon wall with no visible means of support. Exactly how did this gravity-defying flume get there? Little is known about the specifics, but the flume was built as part of a failed attempt to turn a profit placer mining along the Dolores River. Sections of the skillfully designed flume still cling to the rock to this day, mute testimony to the ingenuity of humans on the trail of gold. 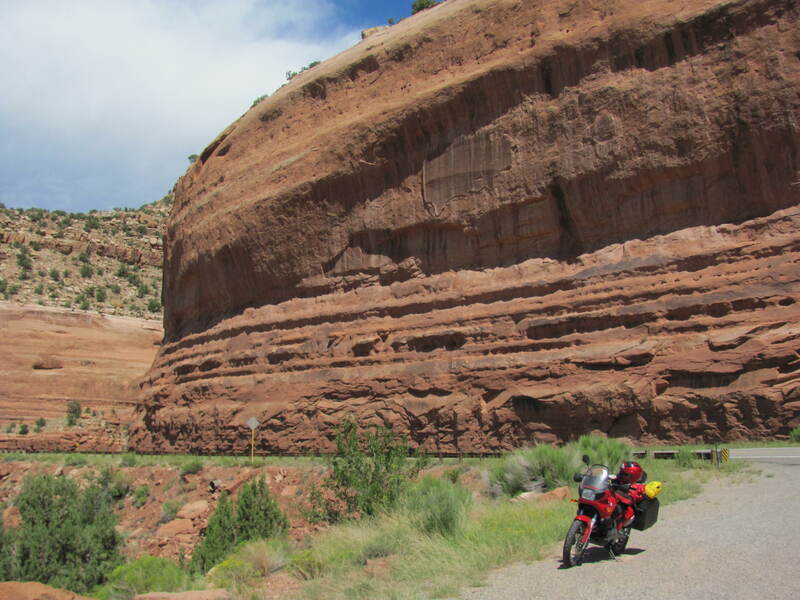 At the end of the Scenic Byway, I turned west, to check out one more of western Colorado’s canyons. Paradox Valley lay about 25 miles of seldom-used blacktop west of Naturita. 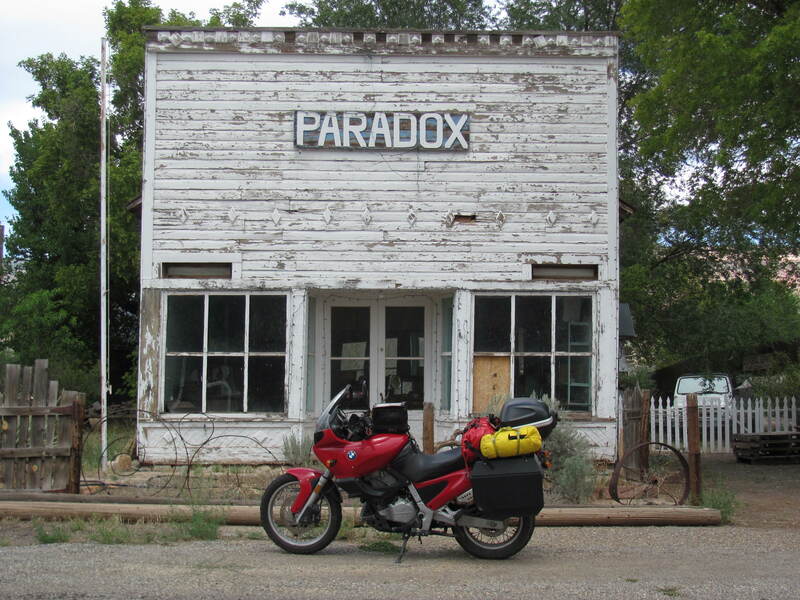 I had to know: what is the Paradox? Turned out the answer was geological. Instead of running from one end of the valley to the other, the Dolores River bisected the valley and exited to the west into the rugged La Sal mountains. There was a logical explanation which involved ancient anticlines, uplift and erosion. Still, it was an Escher-worthy jarring visual, to see the river’s path cross-cut across the valley. I left the Paradox Valley the same way the Dolores River did, and rode through a fierce rainstorm over the mountains into Utah. For the next couple days I rode the red rock country of Arches and Canyonlands. But as I departed those famous parks with their crowds, I found myself longing to return to the remote, beautiful and less known western slope of the Rocky Mountains, Colorado’s hidden canyonlands.